No, the title of this blog post is not a typo. Read on . . . I think they are crazy. One obstacle we face when we consider going on a hike is what to do with our dog William. He is a miniature dachshund and his idea of fun is hiking up to a bowl of dog treats. I don’t blame him. His legs are about 6 inches long and he has to take twenty steps to one of mine. He is what you would call indoorsy. Okay, in truth we bought the backpack because we loved the name and the play on words amused. William was less than amused. The Pooch Pouch is well-constructed, has zippered pockets, mesh sides, padded shoulder straps, etc. The idea of it seemed like William’s Ticket to Paradise (sorry Eddie Money). However, the design is not dog-friendly. William considered it a form of torture. He couldn’t get comfortable and wanted his head out of the top, which meant he was strangulated for the 4-mile hike. Because there is no structure to the pouch part of the Pooch Pouch, it is the equivalent of cramming your dog into a well-ventilated gunnysack and throwing it on your back. The hike made William slightly seasick. Or should I say hike-sick. I don’t think he has forgiven us. Won thing a bout otto-correct . . .
Won grate thing I really enjoy about otto-correct and spell-cheque is that ewe don’t need two worry a bout making typos. Otto-correct bales you out of a whole! I can’t bare too make mistakes. Like my righting piers, I have a flare for righting, which is awl dew two my patients at the keyboard and a hole lot of hard work. Otto-correct makes you’re job as a righter is much easier. But I use lots of fowl language when I type fore ate hours and then my computer crashes when I take a brake two bye a peace of pi. It is undo punishment! When that happens I want too hop on a plain two Aruba, which is a beautiful aisle. Ore go out for some ail at my local pub. You pore you heart and sole into something and then have two prey it won’t be throne into oblivion by a vary evil heroin hoo has come too medal. I’m libel two ripe my hair out. What a jamb for a rider too bee in. It is reel in tents. It makes me want two dye right on the sight, ball my I’s out until I am blew in the face, and clothes up shop. It’s just not fare. Oh gosh, that was painful to right, er, uh, ahem . . . I mean write. All jokes and terrible writing aside, my iPhone autocorrected the word “excellent” to “excrement” in a text to our daughter. The pour poor girl didn’t know what to think. I know you can disable autocorrect, but sometimes the autocorrectedness (is that a word?) of it all amuses. Happy Father’s Day, gents! That is, assuming you are a father. Being a father today is a much different beast than 50 years ago. I know this anecdotally from my vast experience of being fathered by my father, as well as from watching my husband being a father. I also have the facts to back up my claim. Thank you U.S. Census Bureau statistics. Let’s take a look at some numbers from California, shall we? In 1960, 61% of dads were veterans. In 2014, only 6% of dads were veterans. I’ll add here that my dad served in the Navy for 20 years. Single dads ran 0.8% of the families (with no mother present) in 1960. That is a tiny percentage as compared 7% in 2014. Is it just me or does 7% seem low? Higher education was less likely in 1960 where a mere 15% of dads held a bachelor’s degree. In 2014, 34% of dads have college degrees. This statistic really speaks of how times have changed. Think Rob and Laura Petri. In 1960, 70% of dad’s were the family’s sole breadwinner, while in 2014, that percentage had dropped to 31%. To sum it up, fewer of today’s dads in California have witnessed the horrors of war, more are taking on childrearing solo, they are better educated, and the burden of financially supporting the family is shared to a much greater extent. And, they help around the house much more. Thank the lord for that one! Dads spend 6 hours more per week doing housework (my husband says that number is way too low) and 4.5 hours more per week on childcare. I don’t remember my father EVER wielding a dust rag or watching us kids because mom was out. He never helped make dinner and would sit at the table while mom (or us kids) did the dishes. For that matter, he never did a load of laundry, made a grocery store run, packed a school lunch, volunteered in a classroom, or helped with homework. To be fair, he did coach my brothers’ Little League team and took us camping. Dad was a kind man and by the standards of the 1960s, he was a fine upstanding father. By today’s benchmarks, he would get an F-. Or maybe expelled from fatherdom. I think this it is an excellent turn of events . . . this whole fathers-playing-a-more-active-role-in-the-family-unit thing. Everyone benefits, but especially the dads. They get to experience the joys of being a part of a family instead of producing children and then going off to work. It makes me sad to think of the fun my dad missed out on with us kids. And, this is my first Father’s Day without my dad. That is sad too. Anyhoo, hats off to you daddy-o-s out there. Being a father is a noble profession and you are filling the bill brilliantly. Well done you. And Happy Father’s Day to my husband who has done all the things (and more) that my dad didn’t do. He is a man who has embraced fatherhood to the fullest. And he is blessed with three daughters who adore him. I do too. Note the goofy dad photo bombing his girls. Also note my dad in the uniform to the left. Well, folks . . . I’m not as dumb as I look. As per my blog post HERE, CVS Pharmacy issues mile-long receipts, much to the consternation of those concerned with the environment and our nation’s forests. And whiners just like me. In addition to the mile-long receipts, CVS fills my email in-box with 30% off coupons, surveys, ads for what is on sale, and pictures of the Kardashians. I’m kidding about the Kardashian pictures. The Kardashians themselves send me those. The cool thing about the 30% off coupon emails is you can magically send them to your Extracare card, et viola, you get 30% off your purchase without having to remember to bring the darn coupon to the store. “Why are you going on and on about CVS, Robin?” say you. “Good question, but bear with me . . . I have a point.” say I. “A likely story, Robin,” say you. “Oh ye of little faith,” say I. As was promised in the Fortune magazine article I mentioned, I found out how you can opt-out of having the in-store coupons printed on your receipt. Pay attention. This is the part about how I’m not as dumb as I look. There will be a test on it later. CVS came through on their promise to save trees. I swear I won’t continue blabbering drivel about mundane topics such as receipts Instead, I will soon be entertaining you with fascinating subjects such as me, myself, and I. A word before I go on to write the rest of this blog post. Well, maybe more than just one word. Not that I assume that any terrorist reads this blog or would even listen to me, but these senseless acts of violence and murder must stop. My heart (and all the world’s heart) is breaking for the families and friends who lost loved ones in these recent and not so recent tragedies. It is hard to make sense of the senseless. The energy of that visceral hatred could be refocused to do so much good. Peace to all who are hurting right now. Which in truth, means all of us. I love our local CVS Pharmacy. Is it minutes from our house and there is always a parking spot right in front. The pharmacist knows my name from all my Prozac . . . er . . . I mean, vitamin refills, it seems that whatever is on my list is on sale that day, and I know where everything is in the store. And, unlike a usual trip to Target where I go in for three items and mysteriously end up with a cart full of things I didn’t know I wanted or needed and a $325.36 bill, I can get out of CVS in under $20. My issue with CVS is thusly. Why oh why the mile long receipts? I went to CVS today and purchased four greeting cards (to the tune of $14!) and picked up two prescriptions. My receipt was, and I kid you not, 37 inches long! But, I’m hip to their nefarious plan and promptly threw away those coupons and pocketed the Extrabucks. Actually, Extrabucks are a little like winning the drugstore lottery. I swear I could wallpaper Buckingham Palace thrice over with all of my CVS receipts. Queen Elizabeth would not be amused if I did. The Queen’s Guard might get a chuckle out of it. I hear those guys are a laugh a minute. A recent article in Fortune magazine promised the end of the mile-long CVS receipts starting in June of this year. Customers signed up with the CVS rewards program would have the chance to opt-out of paper receipts in favor of digital receipts. Here it is mid-June and no opt-out option has crossed my path. Did I miss the chance to opt-out because I threw away a CVS receipt, or did perchance I plaster it on the wall of QE II’s bathroom? Oh, Belize . . .
Whoa! Lookie-here who popped back into the world-o-blogging for a moment! Moi! I am embarrassed to say that my last blog post was over a year ago. Where did that year go?!? Much has happened which led to the sad detriment (maybe demise is a better word) of this humble blog, as well as any writing whatsoever on my part. The short story is . . . My folks passed away at the end of last year a mere six weeks apart and I am the trustee of their estate, our daughter in the Army deployed to Afghanistan in September (she comes stateside in 10 days! ), my husband was the president of his business association last year and we logged over 16,000 miles of travel up and down California. We invested in a craft brewery. We purchased a home in Boise. We tried to keep our heads screwed on. All of that made for zippo writing time. Oh, not to mention the paralyzing avoidance of writing a query letter for my (finished!) manuscript. For those of you who followed this blog 2+ years ago, you may remember that my husband and I vacationed in Belize, which I chronicled HERE, HERE, and HERE. It was wonderful those 2+ years ago, so what the hell, so we went again last week. We stayed on an atoll 25 miles off the coast of Belize and the only thing on the island besides the resort is a dirt airstrip and a marine research institute. That, and crocodiles in the lagoon. Gilligan might have been in a coconut tree, but I never spotted him. No Internet, phones, or television means you can read, drink margaritas poolside, and snorkel/scuba dive your heart out . . . which we did with great abandon. However, the strangest thing happened . 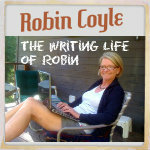 . .
During my 4th or 5th excursion snorkeling, I started composing a blog post in my head. Yes, in the middle of my snorkel! Never mind the nurse shark near my knee or the puffer fish portside, I was writing in my head! One Fish, Two Fish, Red Fish, Blue Fish, Half Orange and Half Purple Fish, Silver Fish with a Yellow Tail and Racing Stripe, Black Fish with Neon Blue Polka-dots, Fish Dressed a Referee . . .
Dr. Seuss would have said, “Oh heck. Let’s just call the darn book One Fish, Two Fish, Red Fish, Blue Fish and be done with it. Mother Nature had way too many rum punches before she designed the fish and coral of Belize. She must have whipped out her box of 64 Crayola crayons (remember those?) and went crazy. There is every size, shape, and color of fish you can imagine and I am sure Mother Nature woke up with one heck of a hangover the next day. But the result of her drinking binge is magnificent. Writing a blog post whilst (how British of me) snorkeling is probably inadvisable given that fire coral, stingrays, sharks, lionfish and any number of other poisonous critters are close at hand. But . . . a lovely thing happened to me while putting my life and several limbs at risk and inadvertently drinking gallons of the pristine waters of Belize . . . I started writing again. Ahhh . . . thank you Belize.